September, the month of the Autumnal Equinox, which actually occurs on the 23rd this year – at 0320 to be precise. If that’s not strange enough, the day which has the nearest to twelve hours of sunlight is the 25th, when daylight lasts for twelve hours and one minute. Such are the vagaries of our planet’s orbit. That invisible line along which our Sun appears to travel, known as the Ecliptic, and along which all the other planets can be found, is getting higher and you may just be able to spot Saturn and Mars low in the evening twilight. You’ll have to be quick, though, because they will be gone by nine thirty. That most famous of asterisms, the Plough, and its polar opposite, Cassiopeia, are low in the north-west and north-east respectively and can be hard to spot. However, overhead is one of the most inspiring sights of the night sky. Avoiding the days around Full Moon on the 9th, if you look straight up (being careful not to fall over in the process! ), you will see a bluish star which is almost the brightest in the sky at the moment; there being one other, just very slightly brighter. You are looking at Vega, one of the nearest stars at just 25 light years away and one of the most famous. This is not what we are looking for. If you’re facing south, to the left of Vega and sitting at one end of a cross of stars is another bright star, looking more yellow. This is Deneb, one of the most distant stars that are visible, at nearly 1,500 light years away. How about that – sixty times further away than Vega but looking nearly as bright. It is obviously much bigger. This is still not what we are looking for. However, this is the part of the sky that is most likely to be least light-polluted. Looking carefully at Deneb, you should just be able to see a misty streak behind it and heading downwards and to the right. This cloud is made up of billions of stars and is the galaxy in which we all live. It is the Milky Way and on a dark, clear night, you can see how it got its name. 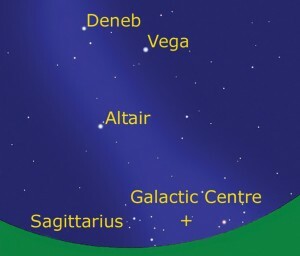 Following it down towards the horizon, you pass a third bright star, Altair, making a triangle with Vega and Deneb. Below this in the same direction, very close to the horizon, is Sagittarius, making a teapot shape, but you may only see the brightest stars. Off to the right is the bright star Antares, in the constellation Scorpius but halfway between the two. You are looking towards the very centre of the galaxy, where lies an unseen, gigantic black hole. Unseen because there is too much interstellar dust in the way, but it is there because cosmologists have done the sums to prove it. So, while you’re all staring at something that no one can see, I’m off to find the teapot.